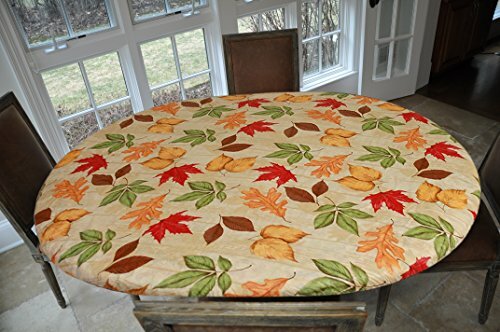 The All-Over Leaves Elastic Edge Table Cover has a Tan Woodgrain pattern with a variety of Multi-Color Leaves print designed to fit oblong/oval tables up to 48" x 68" and the elastic edge holds the cover tight. 100% of the edges of the cover are sewn with elastic which insures that the cover stays on your table. The flocking on the back protects your fine finish on wood tables. Dress up your table for that special occasion while protecting the table from spills, dents or scratches. Made of Vinyl with a polyester backing. Perfect cover for when a round table converts to an Oval/Oblong table when a Table Leaf is added to the round table. Elastic Edge Design Fits Easily around any oblong/oval table up to 48" x 68"